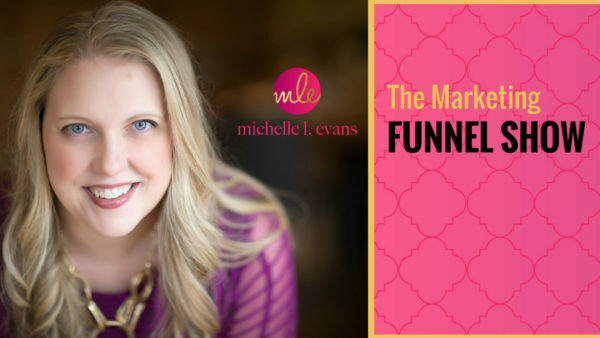 On today’s show, I’ve brought in a special guest to talk about creating her marketing funnel, and she’s super honest that for a long time she hated the whole idea of a funnel. So what turned her around? 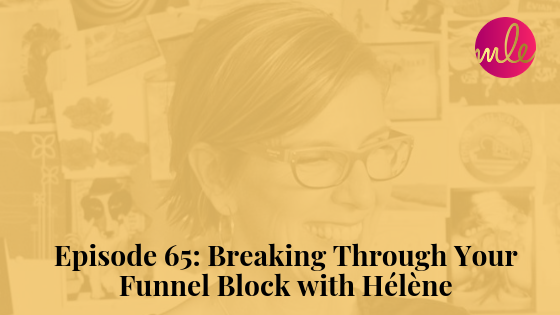 Today’s guest, Hélène, is a Business Alignment Coach helping MultiPassionate Coaches and Consultants create (and profit from) their prodigy-zone. The result is a magnetic brand, unwavering confidence, and a sustainable business model with offers they adore. She’s also an unrelenting optimist, intuitive, mom of two, and a lover of stinky cheese, big trees, poofy clouds, and chocolate. Let’s dive into the interview. Tell us what your business is all about and a little about who you serve and what you do. At the time that we met, I was transitioning from a startup that I had, and I was doing design work. My background is design, and so as I was going into what is it to be in business on my own and moving a bit away from the actual design for hire, the conversation for me was around the branding. I did brand design at that point. I love conversations with people around what their brand is and how to create an end visual that‘s connected to the person's vision of their business. I recognized that, yes, I'm a good designer and I can do this, but it's not really where my heart is anymore. What I love are those conversations. So, through kind of a series of events, I started to work mainly with entrepreneurial women who were starting their own businesses — mainly solo. As those conversations happened, what started to spiral in deeper were the conversations around what it is to be building a business and, as a woman, the confidence factor, the doubt. As the trajectory of my business has taken place, it's really around those conversations of what is it to build a business that's in full alignment with you and having that be the baseline starting point. From there, it’s understanding what's the business model that's in alignment with you? Who are the people that are in alignment with you? What are the offers that are part of that as well? Once you do that, as a byproduct, people get a really magnetic brand. Having worked with you, I know what it’s like to hear some hard truths and be asked the tough questions. You told me you didn’t think I liked the work I was doing at the time at a pivotal point in my business, and I didn’t want to hear it — but you were right. So why do you think that kind of advice can be so challenging to hear? It's the difference of your business starting to feel like a burden. You have questions and know things aren't quite working, and it becomes a dog pile effect that can really bring you down. In your case, you knew the content inside and out, and that's often the part that we take and decide that we’re just going to fit it into this new space of online courses or whatever the thing ends up being. It doesn’t always turn out well. We need to honor what’s happened so far in our business, take what’s worked, and then look forward in order to find our next thing. It’s hard to honor that some days but to really go after what it is we want to do, we need to constantly be asking ourselves the hard questions. You've gone through a few iterations and have a solid following of people who love what you do and have been with you through your different businesses. When you thought about creating a marketing funnel for your business, what was the reason you wanted to get out there and do that? I've known about funnels for a long time, and I'll be really honest, the word funnel is cold to me. When I first learned about funnels, the calculation of it felt impersonal to me. It felt like I'm spinning through something. I kind of held onto that a little bit, and yet the problem was that I put products out — freaking awesome products — and nothing was really happening. I realized I needed to create a path. I didn't know how to bring it all together — the aspects of the people, the product, the questions that I needed to answer — to make that a really tight experience. The big aha that I had in going through Build Your Funnel Bootcamp is that funnels are a form of customer service. Tell me a little about mapping out your own process. How did that go for you? It was painful. You asked me a question that was painful, and I didn't like you for a couple of days. But at the same time, I realized you were so on point. Of course, this has to be asked. Of course, I have to think about this even if it’s hard for me to think about. They were not easy answers, but the end result has been phenomenal. This was not a speedy thing, which I think is another testament to it being the right way to go through it for me. I had to answer the questions that are actually in alignment with me, that are true to my people, to the offer, to really make sure that things matched up. Did you have to answer one particularly painful question? How did you get yourself to work through it? The questions around understanding where my audience was at were hard. I've worked with a lot of people, so I kind of knew where people were at, but you were asking deeper questions. Honestly, I think part of my uncomfortable feelings were tied to the arrangement in where you were asking the questions. I knew you definitely have a playbook that goes through your process and it allowed me to see, oh, this is how this all leads together, this is why this is so important, this is how answering this last question becomes a lot easier because you actually did these other things. Sitting down and really thinking about the questions was rough but I knew I was the only one that could answer these questions. The process of working through those questions has helped with so many other areas within my business on the marketing front of it — thinking about what's coming up next and how I might bring people down the path to that and how they connect. As you were going through Build Your Funnel Bootcamp, did you have a major aha where you're like, okay, now this clicks or just like, oh, this was worth the effort? One of those moments was about re-framing customer service. That gave me a different motivation factor in terms of seeing this through because that's so much of what I stand for in general. That's so much of what I think branding does. If you are branding in alignment with you, it is a form of customer respect, customer service. You want to be as clear as possible what you're up to. I don't think this is the case with all funnels, but the way that you present how to create your funnels, I definitely think it provides an incredible touch point service. It takes the time to set it up at first, but what it is on the flip side is phenomenal for everyone. Part of the Bootcamp was the support with writing the emails. The way that you broke down the stages was so incredibly helpful. Having the additional instruction on the formation of the emails was amazing because before I’d think that I had to write a nurture sequence and planning it out felt so big and overwhelming to me. What kind of funnel did you end up building, and what is it that your funnel's about? The end product is something called a Signature Offer Decoder. I work with multi-passionate coaches, consultants, teachers, and the idea is to take all your things and kind of bring that into one thing. I was offering a masterclass, but I realized that that wasn't a good fit. Based on your questions, it made me realize that that actually wasn't the best thing for me to start off with. So, it's now a pdf with a companion audio to walk you through, and it's this whole kind of workbook. The beauty of what Build Your Funnel Bootcamp offers is there are a bunch of different funnels and pathways to go down. I never really understood how to build out multiple funnels, and now I do — which is phenomenal. The other thing is all the testing. I've just recently finished a funnel, and I'm going to see how it goes. Because I understand the process, now I can see where the little changes will be. Now that you do have your traffic for your funnel, how do you feel about driving traffic to it? I feel like I graduated from guessing to now having a level of confidence. It's so much easier to talk about it, and I know what I built is solid. I know that there's the testing that has to happen — I'm not expecting to hit a home run out of the gate — but what I built, the product and the opt-in, are solid. Up until I started building funnels, I felt like I was doing random acts of marketing. Once I had a funnel, I knew what I needed to do to get people interested in going through it. If you were talking to someone about Build Your Funnel Bootcamp, what do you think you'd say to them? I’d want them to know that it’s a woman behind the creation of this program. Most of the people I work with are women, and a lot of them come to me a little jaded about online marketing, kind of the “bro-verse.” We all have somewhere we feel safe, comfortable, and where we connect. Oftentimes, many of us have learned or bought programs with people that in the end were not the best connection. It’s super easy for me to recommend Build Your Funnel Bootcamp in that I know that that's also what they're searching for — someone who they can connect to and that they feel is coming at this from a holistic standpoint. It’s about coming from a place of service and people — not numbers. Any last things that you want to say about the experience or how you feel about moving forward with your funnel? It sounds simple, but the fact that I have confidence around it is huge. It makes all the difference in the world because I knew I've been in this long enough, and I knew this was something that I needed to do. I knew that that was the next step. I knew that I wasn't going to do it alone. I knew I needed help because I wanted to do it right and I hadn't been doing it right. Like in terms of right for me, right for my business, right for my products. There was this pocket of time where I didn't really have something that I felt good about pointing somebody towards, and so having that confidence level is huge.